A handgrip, a shaft, and a blade; these are the main parts of a paddle. 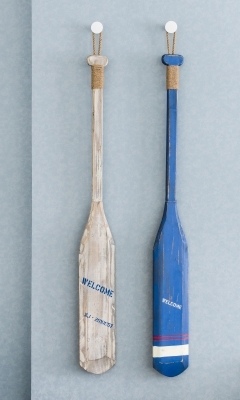 A paddle is a simple but indispensable tool for directing certain watercrafts and boats. A paddle and boat are one of the oldest forms of travel. Paddles can be used for two purposes, propelling a boat and steering it. For some boats, a single paddle can be used for both purposes, for other boats, one paddle is used specifically for steering and others for propelling it. Of course many boats have a rudder for steering. But historians tell us that rudders were adapted from a steering paddle. Have you ever marveled at how easy a small paddle blade can quickly change the direction of a much larger boat? It is rather impressive how easily a paddle can propel a heavy boat. A few strokes and your canoe or kayak is going several miles an hour. One twist and the whole boat is redirected. Although small in comparison, the paddle has great power. In James 3:4 the Bible uses this as an example of how the tongue is small but can have a great effect. The tongue is a very small part of the body, but it can bless or curse, it can heal or destroy. A few unthoughtful words can destroy a friendship or a reputation. Whereas, a kind word can brighten someone’s whole week. In a few minutes of anger, a person can speak words causing bitter feelings that last years. It is important whenever we speak that we think about our words. We should never speak the first thing that comes to our minds. Many people allow their feelings to determine what they say without thought for long-term effects. This is unwise. As Christians, we must do our best to control our speech. Everything Jesus said was meant to help the listeners, even his enemies. We should try to do the same. Can you think of small word someone said to you that meant a lot or even changed your life? What can we do when we get angry instead of saying hurtful words? What simple words could you say to someone that would be meaningful?